There has been a little stir in the news on Energy lately, as folks have begun to extrapolate the growth in American oil and gas production to the point that they predict that the United States may out-produce Saudi Arabia, in terms of the totality of hydrocarbon production. 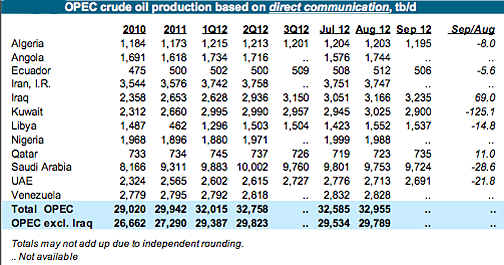 Of course, in some cases, it has been North American oil independence that is featured, rather then that of the USA. And the reason for the generalization is that by broadening the geography so that the region also includes Canadian and Mexican production then the US imports from those countries magically disappear (which does not mean that they don’t have to be paid for. 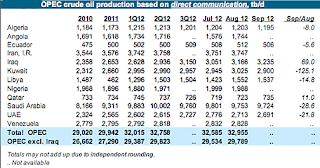 The US imported around 2.5 mbd from Canada and 1 mbd from Mexico in July). The stories also don’t dwell on the comparison of apples and apples. Consider the following quote from NPR. It is that easily missed sentence at the end of the first paragraph that is critical. In 2011 the U.S. produced 5.66 million barrels of crude oil a day, according to the Department of Energy's Energy Information Administration. 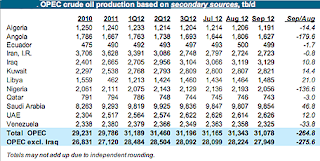 By next year the agency projects that will increase 21 percent to 6.85 million barrels a day. 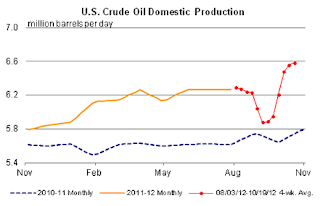 Add in things like natural gas liquids, biofuels and processing gains at refineries and that number increases. 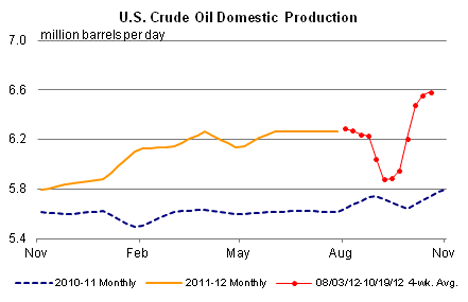 "By 2013, we'll probably be a little over 11 million barrels a day," says EIA administrator Adam Sieminski. "That puts you pretty close to Saudi Arabia's" production of more than 11 million barrels a day, he says. In which regard it might be pertinent to note that some of the crude produced in the Kingdom of Saudi Arabia (KSA) will be refined in the US, providing refinery gains here, and further distorting the comparison. Ah, well! The current production gain in the US has resumed, after a short plateau, although the gains following the shut-ins for Hurricane Isaac seem to be leveling off. The information in the October Monthly Oil Market Report from OPEC, show that crude oil production from KSA is running at 9.85 mbd, as reported by other sources. 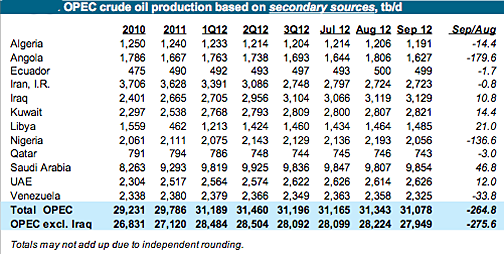 When one looks at the production that KSA itself is reporting the numbers are slightly reduced. While the comparison of the two levels of crude suggest that the US has a long way to go in matching KSA crude production, the two sets of figures also point to the answer to another question. Looking at the figures for Iran, it is clear that the sanctions which have been imposed on that country by the West are having a serious impact. Not only is this seen in the fall in oil production, likely around 1 mbd, but in the more consequential cut to exports this fall is reflected in a $7 billion reduction in income. Iran has just started to admit that this bite in their export market is hurting production. And it is only now that they recognize that this will further fall, though they are now also threatening to carry this drop to its ultimate conclusion, and to stop exports entirely. An immediate impact to this would fall on Turkey, which has cut oil imports from Iran by about 20%, but which has a six month exemption from the full impact of the sanctions. It is currently importing around 200 kbd of crude. Some of the value of that oil is apparently returning to Iran as gold bullion, which can be easier to spend. However the primary question might well be, if world oil markets are so tight, how come taking a million barrels out of production hasn’t had a more significant impact? And the answer to this comes in part because of the increase in production from KSA (Note that a year ago the country was producing around 500 kbd less than it currently is), and also from the gains in production from the United States. (As shown in Figure 1). Further, given that the global economy, though regenerating from the depths of recession, is still not operating at levels sufficient to bring unemployment to more normal levels, overall demand also remains below what it might be. Since we live in a global economy the problems of Europe and America are reflected in a reduced demand for goods from China and other Asian countries, which impacts the energy demand from factories. 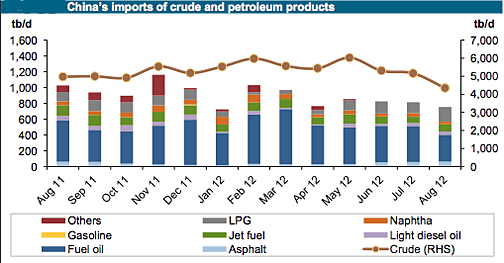 China has been taking some 40% of the Iranian export. OPEC has noted that Chinese demand has declined, and that part of this decline has been through an 18% reduction in imports from Iran. Interestingly this was partially made up through an increase in imports from Iraq. One of the threats that Iran has made it that it will shut down its exports completely. The country was initially exporting some 2.3 mbd before sanctions occurred, and sanctions have dropped this already to around 860 kbd. 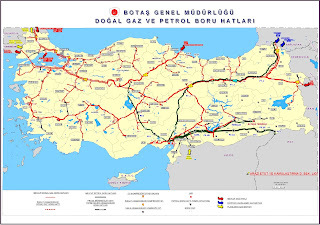 Of this 200 kbd are going to Turkey, but this is a country with pipeline connections that give it options. 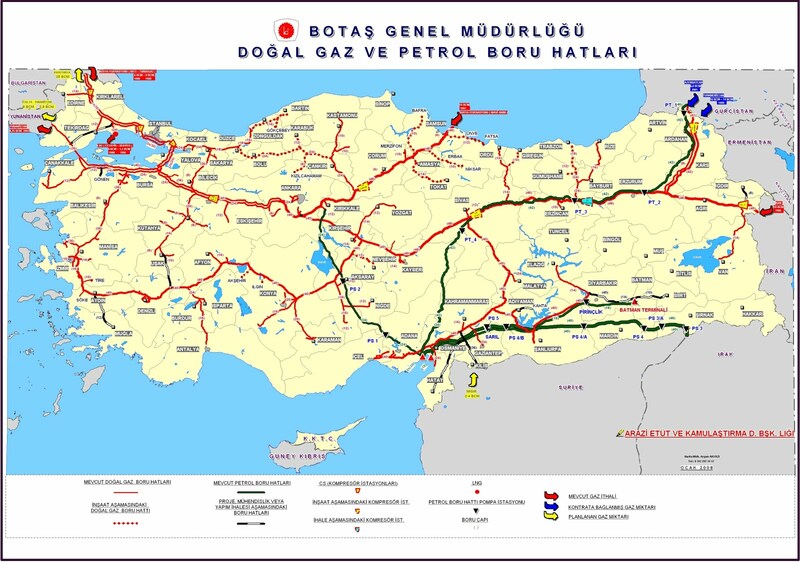 There is a pipeline running from Iraq, the Kirkuk- Ceyhan connection which carries 300 kbd, and was briefly damaged by fire in August; and, more famously, there is the Baku-Tiblisi-Ceyhan pipeline from the Caspian. This can carry 1 mbd of crude, and having run 190 mb through September this year, it is running not quite full. 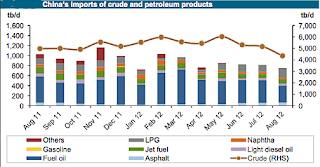 In short, as with the suggestions mentioned the other week, that Iran might seek to challenge Qatar in going into the natural gas LNG market, the threat this week that it might shut off exports of crude seems to be likely only geared for domestic consumption. The global demand at present is not such that the Iranian supply is critical to ensuring a balance at an acceptable price between supply and demand. It would seem that the global economy would need to regenerate further, and for North American and KSA to reach some form of current peak in production against that potential of rising demand before this balance is threatened. But, in consolation to Iran, resting oilfields can sometimes help in terms of their longer-term production (as KSA have practiced for years).